Hearty congratulations on your birthday and that you may celebrate that day with all of you for another number of years. Days and months go fast, I hope this [letter] will reach you on Sept. 7. Yesterday morning I planned to write when Jaantje and her 3 girls came to visit me. Then it is a treat for me and for all of us. Jaantje brought me a chicken, roasted and ready for dinner. After dinner the little girl had to sleep and both oldest were playing outside, they like that very much. Then they are their own boss and they both were very busy. 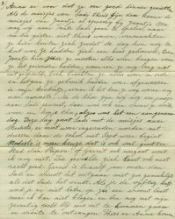 The girls of Gerrit and Sadie went out for a day together with Thies, Anna and Clarence, their boy. They went to Stockton to a park. Stockton is a big city there is more than one park, children can enjoy themselves very much. Then they leave here at 10 o'clock in the morning by car, Anna takes enough [food] with her for dinner. In the park there is a large gas-cooker where she can make dinner, the children love Vienna-Sausages [she wrote Wieniroost], that are those small sausages and then fried. So Anna takes care they will have a good dinner. When Sadie's girls are at home than Jaantje's girls will ask soon: Mother can we go to Aunt Sadie to play, because they were not a t home yesterday, they enjoyed themselves here outside so much that their day was too short. They built themselves a house, when Jaantje told them to bring everything where they had found it, it was too early for them. Nevertheless they made everything right. And the things they had used were washed up in my little kitchen, where I washed it up again after they had left. After tea we went to Sadie for a while, there also was a woman paying a visit for a cup of tea, so it was a pleasant day. Today Sadie goes to Modesto with the girls, dresses have to be bought because school will start again in September. In Modesto is a larger assortment than here, it is also a bigger city than Ripon is. If Gerrit goes with them, I don't know yet. The other day he was not very well. Gerrit is twelve years older than Sadie and don't like to go out like Sadie does. When you are fifty, things don't become better, a woman said the other day. But I may not complain and however I am seventy I am happy to go out sometimes and to get visitors. Also Thies and Anna come here for a cup of tea or coffee, I find that very pleasant. Two weeks ago I went with Thies and family, which are anna and Clarence, to Ytje and family. They live in Empire which looks like a small village in Holland. It is situated at the other side of Modesto. Then we first went to the church in Ripon and from there to them. We had a nice dinner and a pleasant day. Also Geertje, who knew we were there, came. Dalton and Geertje now live in Oakland again which is again much closer than Eureka. Now they can visit us more often. When the store is closed on Saturday evening they can make the trip to us or when they arrive at midnight it won't hinder such young people. Dalton is the chief, in that big store there are 17 clerks and helps. Dirk and Jaantje were also in that store the other day when they went to the show in San Francisco. Yesterday Jaantje said: I would not know what you cannot find there. Mr. Williams is the owner of those big stores in Oakland, Eureka and other big cities here in California. Mr. Williams also owns farms where he has farmers on like hired farmers in Holland. I also have to congratulate Uncle Sjouke from Jaantje. 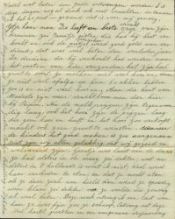 The letter from G[errit] and S[adie] will arrive some later with you because S[adie] is very busy to can fruits these days. I canned 20 pints which is enough for me. Ytje's husband Do has a nice crop of his grapes Jaantje said yesterday. He sold them well and also much money was earned with the peaches, which is a lot better than last year. The grapes he sold were transported to east of here, it is a very large kind [of grapes]. They don't milk many cows because they don't have much alfalfa on their 60 acres, so they don't make much hay. At that side of Modesto there are more fruit trees than here near Ripon. Milk prices are low these days and also the hay prices are low. The one who has no cows and sells the hay makes not big profits. When the children are well it is very pleasant. How happy we all are that we are healthy and prosperous. Geertje had to follow a diet the other day, she had ulcerations in her stomach doctor said. 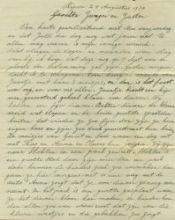 What 'olsters' [she wrote] are in Dutch I don't know, many things were her forbidden to eat and when she kept what she was allowed to eat then it soon would recover, doctor said. Well she felt much better that Sunday. This week I received a card from her, she was fine after she wrote. Receive with this many hearty greetings and a pleasant birthday. 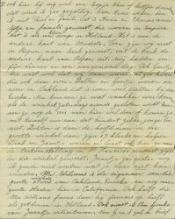 [At the left side of the page is written] for all of you is the wish of Your Sister Boukje Schuiling-Dijkstra.